I am trying to get a silver inlay design done to an albion sword. I am getting this sword customized by Christian Fletcher. He is giving it a new grip and probably a nice scabbard (once I make up my mind). I would ideally like to sword to have a silver inlayed star on the pommel, but I don't think CF does that sort of thing. It may even be nice to have an historical silver star covered over by a crystal disc. I have discovered this was done for fanciful designs after reading Oakeshotte's "Records of Medieval Swords." Do any of you know a place that will do inlay work or even insert a crystal disc into a pommel? (I could have the material wrong, maybe it wasn't crystal). Anyway, a place that does silver inlay work is what I am looking for. Do you think a common engraving shop would do that sword of thing? Thanks for the help. Did you ask Christian about it? He's amazingly skilled, and I'm sure he could do it if he's willing. I actually did some inlay work myself, and I have no proper training whatsoever. I used this site as my only reference. That is definately good work as far as I can tell, especially for not having any training. Something like that is exactly what I am looking for except using silver (My family crest is a silver star). Maybe Christian can do it, I have asked him, just awaiting a reply. I know how to put you in contact with one of the best Northern italian engravers, working in Gardone Valtrompia, the town that is worlwide famous for ist hunting weapons (Beretta, Benelli etc. ), which are often marvellously engraved. He works also for a fine maker of damascus knives that is also a close friend. Other engravers could be available there. Such weapons cost thousands of dollars, but less expensive work can be made. That looks great and is entirely smooth/even enough to be considered historical. I really have a thing for inlay on historical weapons and on their reproductions. Inlay was so commonly applied that I want to work some examples into my collection. I think that copper cross would look super great on an Albion Duke or even a baron if such a thing is possible. Todd of Todd's stuff does inlaying but I don't know his policy of altering the work of others. But inlay- all inlay is great- iron, silver, copper, latten/brass, even gold, then there's niello. The artsans at OLLIN really did a nice job on the example on their site. The design is a little strange but the execution is perfect. I would be interested in seeing a drawing of this "star"- I think I do remember some similar "starish" designs. I suppose another question I have is: How historically accurate is it to have an inlay design on a pommel on a sword that is not from the viking age? I basically want to get a silver star set inside a bronze shield, but would it be more historically correct to get enamelling done on a sword that would be from 1200-1350? Any info would help greatly, thanks! There are a number of pommels with inlaid designs or inset coins or medallions from the High Middle Ages. The sword you and I have corresponded about has an inlaid cross in the pommel. That seems to have been not uncommon. Thanks for letting me know. I didn't even know the design on the sword we talked about was inlayed, I thought it was etched (I should learn to read more carefully). I plan to get that sword made by someone in the near future - the exact sword itself without any customizations. I will however have to guess on what grip would have been used. Thanks again! The sword I am going to get done soon will have an entire family crest inlayed in copper and silver on the pommel. 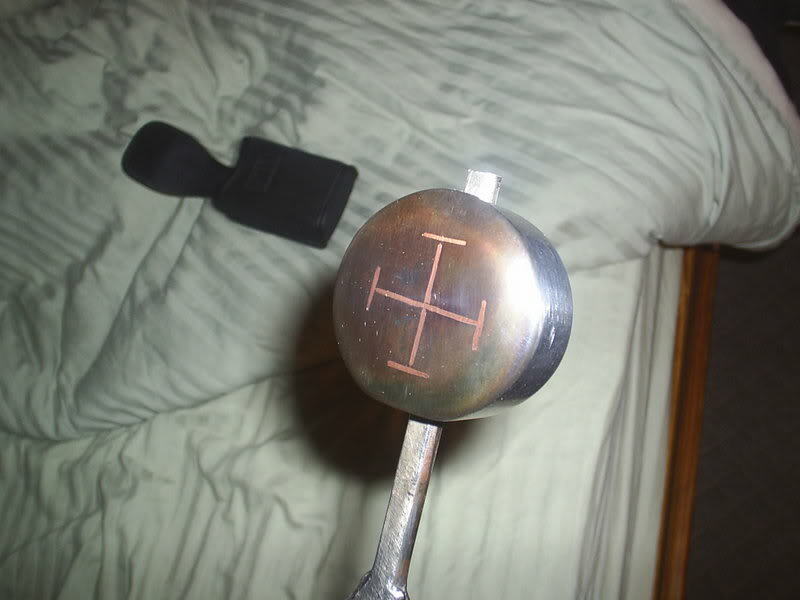 The one we discussed, and all I have seen, only have a smaller design inlayed on the pommel, usually a cross. So I hope larger designs like the one I want were inlayed as well, otherwise, do you think it would be better and more accurate to go with a disk or medallion even? Inlaying other metals as decoration seems to be more common than engraving and much more common than etching for medieval weapon decoration. Etching is used a lot in later periods, especially as armour decoration. I don't know that I've seen entire crest inlaid like you're talking about. Enamel discs, coins, metal discs do occur, though. That is what I thought, and that is now why I am considering not doing a full crest inlay. Is enamel work hard to do and expensive? Aso, how would coins and medallions be held into place? Thanks again. 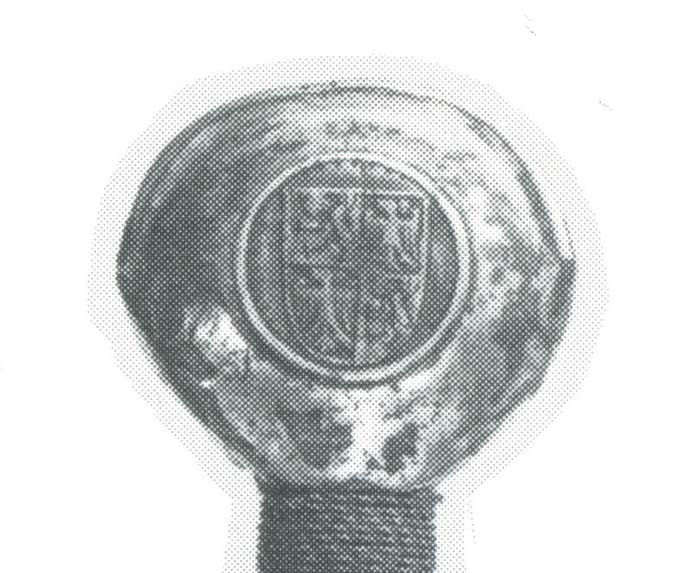 On A&A's repro, the crest is cast as part of the pommel and then painted. On the original sword, it was an enamelled disc. How medallions or coins would be mounted would depend. I believe there's evidence of glue. Also, you could crimp a rim on the pommel around the disc's edge, holding it place. Thanks again Chad for your help. Sorry to keep drilling you with questions but I just have one more (I think ). What material were these coins usually made of? The same material as the blade, myabe a higher or lesser quality steel, or something new altogether? Edit: Also, if anyone could provide examples of swords with full inlayed crests, or the like, on their pommel that would be greatly appreciated (if they indeed exist). I don't think blade steel would be wasted on decoration like that. The ones I've heard about are what coins/medallions were usually made of: copper, bronze, silver, etc. For examples of crest/designs on pommels, have a glance through our Oakeshott Type spotlight series (and other articles) on the Features page. There are a number of swords with decorations in the pommels. Here are three examples, all using enamel. 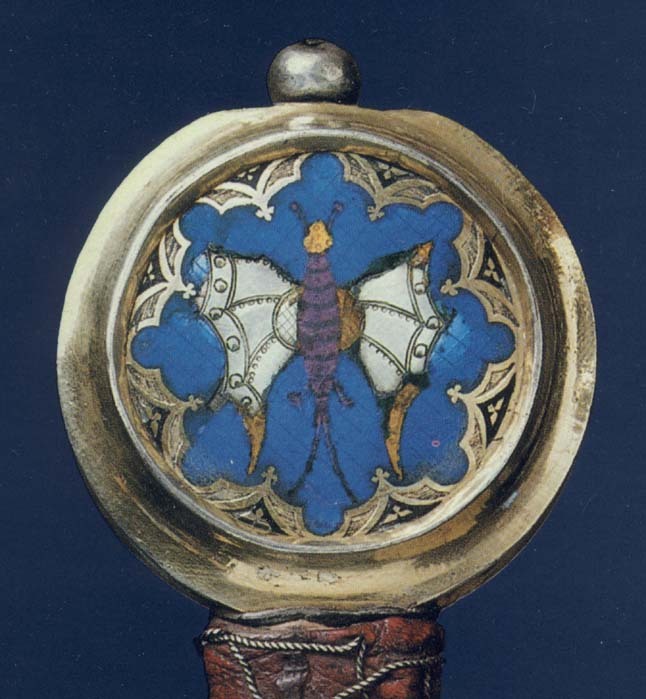 Not a conventional heraldic device, just an interesting butterfly.